The Thanksgiving holiday and weekend is over. Apparently this year’s Black Friday was a success. I contributed to that success but Mrs. Crucis couldn’t find her bargain. I think because of the Holiday, the “crisis du jour” was absent. The TSA appears to have ducked and many of the body scanner/molestation lines at airports were shutdown late Wednesday. According to the Triple-A, highway traffic was up 16%. Whether this increase was because of the new TSA procedures or if people were traveling in relief from the more recent political season. Likewise, here at the Court, I don’t have a specific topic but a couple of subjects to ponder. Case in point: Kansas City is in mourning today with the news that conservative radio host, Chris Stigall is leaving for a new job in Philadelphia as morning show host at WPHT. PHILADELPHIA (CBS) – CBS RADIO’s The Big Talker 1210 AM announced today an enhanced lineup of personality based programs which will begin to rollout on Monday, January 3, 2011. Leading off the day on-air and online at www.CBSPhilly.com will be one of America’s up and coming talk show hosts, Chris Stigall who joins the station from KCMO Talk Radio 710 in Kansas City where he has hosted morning drive since 2006. From 5:30-9:00AM Stigall will discuss local and national policy, the economy, the biggest news stories and issues that affect all Philadelphians, coupled with interviews of the day’s news and decision makers. Stigall’s last broadcast day in KC is tomorrow, the last day of November, 2010. Mrs. Crucis listened to Stigall every morning. She would get up early and do her daily walk while listening to him. She wasn’t quite in shock because she’s been expecting Stigall to go national at any time. Frankly, I think he’s as good as Michael Savage and some of the other nation-wide radio hosts. I believe the next generation of personal computing is upon us. In this last year there has been a shift—in reading habits. 2010 is the first year that sales of ebooks and digital magazines exceeded that of their dead-tree counter-parts. I am a reader. I have not willingly tossed any book that I’ve bought in my life. I have lost some. I have had some damaged beyond repair due to water seepage. I have sold some paperbacks to a used book reseller just before our last move. A decade or so ago, Baen Books created their Free Library.They made books available for downloading in various formats and all free! I downloaded every one. I even kept copies at work and they kept me company many long nights when I was working a call center turn-up or when a network failure occurred and I worked with tech on a conference call to restore service. Like many situations, there would be minutes of intense activity followed by longer period waiting to see if results were successful. Those books help me stay awake and alert. A few years ago, Amazon released their Kindle e-reader. Amazon was not the first. There have been a number of electronic readers for years. But the appearance of the Kindle started the flood of ebooks. I finally broke down and bought an Aluratek Libre Pro ereader last summer. It was cheap—under $100, and I could afford the investment if it failed to meet my expectations. It did. I haven’t bought a paper book since. I’ve also saved money. Ebooks are cheaper than paper books. Since I’m now retired (officially,) that is important. One reason the Aluratek ereader is so cheap is that it uses a LCD screen instead of the more popular eInk or ePaper technology used int he Kindle, KOBO, Nook and SONY ereaders. That technology has a very irritating affect. The page flashes black every time you change a page. 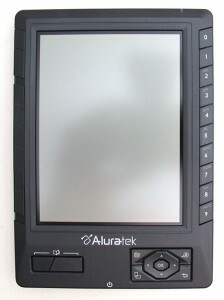 The Alurateks LCD screen also had a very irritating feature. It was dark. I like to read in bed. There’s a single lamp on the night-stand. Reading the Aluratek LCD screen in dim light is a strain. After 10-15 minutes, my eyes would be watering and my vision was strained. So, I’ve been looking for a replacement—an upgrade. Something with new technology and something that could be used for more that just an electronic book. As a parting perk on my retirement, I was able to buy an Android-based phone using my employee discount. I fell in love with that phone and the Android operating system. I seldom use my phone for talking. My wife is a texting addict. We text (When did a poor noun become a verb?) each other constantly during the day. Texting has replaced shouting up and down the basement stairs. It is ideal fro short communications that don’t need an immediate response—or any response at all. The point of all that is that I’ve been looking for an Android based ereader. There are a number of Android based devices just coming on the market. Many are not phones although some, like the Samsung Galaxy Tab will be sold by some major communications carriers like Sprint and have wireless and wifi communication built-into the devices. These are in the same class as the non-Android iPad but a $100 or so cheaper and will have the advantage of an open source operating system. Just look at the plethora of Android apps available in the marketplace. B&N has their color Nook that uses an abbreviated version of the Android system, Borders has two versions of Velocity Micro Cruz, a reader and a tablet. Even Amazon is reported to be working on some form of color Kindle although the details are sparse. When I saw the “Black Friday” ads from Borders and saw the $50 off on the Velocity Micro Cruz Tablet, I bought one. I have an internet friend who bought one a couple of weeks ago when they were first available and she had problems. I’ve investigated the device, compared the features with its counterparts from B&N and other providers and the PRICE! I succumbed to temptation. I bought one on-line. When it arrives, I’ll write up a review. Google has been pursuing Microsoft and their Android operating system is planned to compete with Windows. Microsoft has become complacent. They haven’t really produced anything that is innovative. Each new release of Windows is just a refinement of the previous version. Google has been smart. Like Linux, they’ve made their operating system open-source. The multitudes of Android apps is testament to Google’s success. This coming year will be interesting for the personal computer user and the those who just surf the internet. True portable computing has arrived. I’ve been reading and watching science fiction since I was able to read. Since that time, some (mumble…mumble) years ago, I’ve seen SF tech come to life. I was in the Air Force when I watched Neil Armstrong and Buzz Aldrin make those first historic human steps on the surface of the moon. Years later I watched a telecast from a robot showing the surface of Mars. Over the decades, I’ve seen photos of the moons of Jupiter and the rings of Saturn. In addition, some well respected scientists now believe that Star Trek’s warp drive may be possible. But there is one bit of technology that has evaded us. A recurring tech over the decades has been 3D-TV or as it has occasionally been known—Holo-TV. It even appears on the TV show Bones to recreate faces from a skull. Thee-D movies have been around since the 1950s and have had a resurgence in the last decade. So called three-D TVs have been marketed for a year or so. But all of these implementations have a fatal flaw. They all required special glasses to fool the eye into seeing the appearance of three dimensional scenes. Toshiba is about to launch a true 3D-TV that does not require special glasses. You can see true 3D from any angle without any other assistance than human eyes. The Holo-TV has arrived. Japanese electronics giant Toshiba plans to market the world’s first 3D television that does not need special glasses later this year, a report said on Tuesday. Toshiba will unveil three models of the television, which will cost several thousand dollars, before Christmas, the Yomiuri Shimbun said. Yes, the SF Jubilee has arrived. I wonder if I can afford it? I finally broke down and bought an eReader—the Aluratek Libre Pro. Borders has a deal going on, $119 + shipping. The Libre is no Kindle or SONY. It is not top-of-the-line. 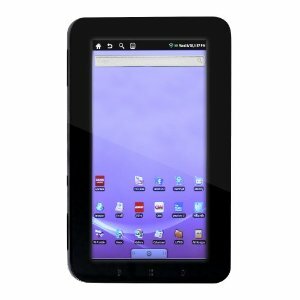 It uses a LCD display instead of the more popular e-Ink technology, it is not a touch-screen, nor does it include wireless 3G connectivity to a proprietary ebook source. That’s the primary reason it is so cheap. It’s just a simple eRead using USB to load books from a PC. It also has a slot for an additional SD/SDHC memory card up to 32GB. I added a 16GB card to mine and also bought a 16GB flash drive to backup my digital library. Because my official retirement is coming up in a few months, I had to find a way to continue my reading “fixes.” I normally spend $50 to $90 a month on books. The biggest portion is hardback books from Amazon. The remainder are paperbacks from local books stores. That amount will soon be beyond my budget. However, I noticed that digital copies of those same books costs 50% or more less than their dead-tree versions. I’ve been collecting eBooks for years. I have all the books from Baen’s Free Library as well as those provided free via CDs included in the hardback editions of some of the more popular Baen writers. For example, I have eBook copies of the entire Honor Harrington series by David Weber. The great part about Baen digital books is that they are available in the more popular digital formats—.epub, .lit, .mobi/.prc, .lrf, and .rtf as well as in html for online reading via a browser. So, I’ve been busy. I’m charging the eReader and setting up my digital library. I downloaded some favorite books from such writers as H. Beam Piper and Randall Garrett and many more from the Golden Age of Science Fiction. The current count so far is 306 books in the library and as soon as my reader is charged, I’ll load it up. While eBooks have been around several years, this year is the real beginning of the digital book age. The sales of eBook readers has taken off like a rocket. As the prices of eBooks and eReaders drop, the demand for eBooks will accelerate. There is still a battle for dominance of which format will be used for eBooks. Amazon is staying with their proprietary Kindle format which is a variation of the Mobibook format (.mobi/.prc). The difference is DRM added by Amazon. Because the Kindle format is proprietary, it will not win the format war. My personal opinion is that the Epub format will eventually win. It is, I believe, open source and requires no license nor fees to be used. All the other formats are patented or copyrighted but anyone can use Epub. I detest DRM. DRM means that I do not own the books. DRM means that I’ve only leased the book from the owner who can reclaim the book whenever they owner wishes. In fact, Amazon has already done that amid widespread complaints from Kindle owners. That is the reason why I won’t buy a Kindle even though I buy almost all my hardback books from Amazon. What is worse is that the Kindle can only install eBooks from Amazon. When I was investigating the different offerings, I could find no way to install an eBooks from any other source than Amazon. SONY makes a nice eReader but it has many of the faults of the Kindle including the use of a proprietary book format. For Me, I’ll stick with the Libre. I expect there will be a lot of improvements in eReaders. I expect more low end readers using e-Ink instead of the cheaper LCD used by Aluratek. I wouldn’t be surprised to see the price of eReaders drop below the $100 mark well before Christmas. I also expect a steady progress in the technology—better displays, color and much improvement in battery life. BTW, for you FTC folks, I paid for my Aluratek Libre out of my own pocket. On Drudge today, Google made a surprising announcement that it will be partnering with the NSA to improve the security of Google’s network and systems. Google and other commercial enterprises have been under severe attacks from foreign agencies. Google and China have been in opposition over censorship orders from the Chinese government. There will be a Hue and Cry from those around the world who view any cooperation between a corporate entity and government with alarm and suspicion. They will view any such agreements as collusion to invade personal privacy. Anyone who spends any time on the internet knows that users really have no privacy on their communications and shouldn’t expect any. Advocates of encryption admit that such will only delay any serious inquiries, not block them. I use Google as a preferred search engine. I have an email account with Google and this blog is hosted by Google. I’m not totally pleased with all of Google’s corporate actions but I’m less pleased with their competitors—Microsoft for instance, than I am with Google. Here is an excerpt from today’s Washington Post. Follow the link for the entire column. Be aware that the Cyber War has been going on for over a decade. It is now getting more publicity but the attacks against our nation’s network infrastructure will not cease. When I worked for a large communications company, I was aware of foreign attacks against the company’s networks and systems. Few got through. Some did and deposited some virii on occasion. The company was ever vigilant and very alert for any incursions. It was an unending battle. Now Corporate America will have to step up thier efforts to do the same and harden their systems. Too many just give lip service to corporate security. They will pay severely if they don’t take remedial action immediately. The intrusions, industry experts said, targeted Google source code — the programming language underlying Google applications — and extended to more than 30 other large tech, defense, energy, financial and media companies. The Gmail accounts of human rights activists in Europe, China and the United States were also compromised. Now this just might be useful if the cost can be controlled. I was doing my morning scan of headlines and came across this bit of scientific news. The article continues that the new battery, developed by MIT, could overcome an issue with electric cars—the period of time it takes to recharge the battery. With this new battery, an electric car battery could be recharged in the period of time it takes to fill a conventional car’s tank. If the cost of these batteries, their usable lifetime and the cost of a re-charge could be retained in the same range as that of a conventional gas-burning automobile, we may have a real challenger to the internal combustion engine. The quick-charge battery is the brainchild of engineers at the Massachusetts Institute of Technology. The MIT team say their invention uses materials already available to battery manufacturers and would be simple to mass produce. The invention is based on conventional lithium ion rechargeable batteries found in most cameras, phones and portable computers.